Everris micronutrient products are specially formulated to improve the overall performance of your major nutrient program. To provide a frame of reference, the list of micronutrients includes: Iron, Manganese, Zinc, Copper, Boron, Molybdenum, Chlorine and Nickel. These micronutrients are sometimes called minor or trace elements and are needed in only very small quantities. They are essential for plant growth. Following are a few examples: boron regulates other nutrients; iron is essential for the formation of chlorophyll; and zinc is part of the enzyme systems that regulate plant growth. Through extensive research, testing and field trials, Everris has developed the following products, which include the right micronutrients—in the right ratios—to assure they effectively work together to deliver the desired results you need to grow even better quality plants. This leading homogenous granular micronutrient fertilizer maximizes sulfated elements for optimum plant utilization and prevents micronutrient segregation. 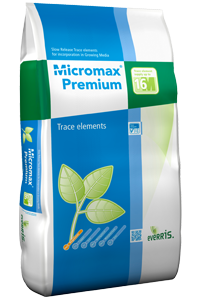 This is a good product for general nursery and greenhouse production when additional micronutrients are desired or required.